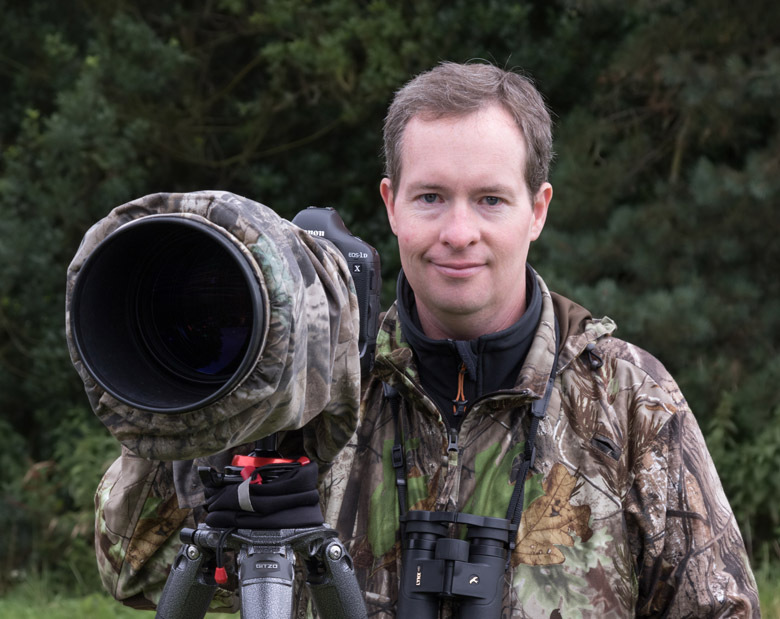 Pete is a professional photographer and photography guide, with a passion for all things wild. Based in the West Midlands, he travels the UK extensively and frequently to capture images of the diverse array of wildlife that inhabit or visit the British Isles. With an obsession for birds of prey, he spends many weeks each year in locations he has found to be rich in such species, such as Norfolk, mid-Wales, the Cotswolds, Chilterns and of course Scotland, with the Highlands and West Coast being particular favourites. Pete is also an occasional artist, and has recently started to create some wildlife-based caricatures, using coloured pencils. He attempts to play golf too, though normally finds more interest in the wildlife on the course, than the game itself! Pete was featured in an online blog in March 2018, as can be seen here. 1When did you take up wildlife photography? I first started pointing my camera at wildlife, around the early noughties, usually at robins in the garden, though I recall being fascinated by a pair of little owls living in an old oak tree behind the car park where I worked. I never had quite the zoom to get a decent image, alas. I got into wildlife photography properly in 2006, when I invested in a digital SLR camera, and a zoom lens, and have been obsessed ever since. 2What cameras have you used? Way back at the start, I used a simple point and shoot, I think it was a Canon A30, adding extra zoom lenses, and then upgrading to a super-zoom Canon, the S2 IS. At the time I thought it was brilliant, and was happy with the pictures, until I saw some from a D-SLR, and realised I needed to upgrade again! Since then I have had a Canon 350D, 40D, 50D, 7D, 7D mk2 and currently use a 1DX. 3What lenses do you use? I make use of a variety of lenses, all from Canon. I have a macro (100mm), landscape (24-105mm) and zoom lens (100-400mm mk2), plus my trusty old 500mm prime, which I find works very well with a 1.4 teleconverter. I'm always on the look out for other lenses, and may well invest in a wider angle lens, perhaps the Samyang 14mm, or maybe the Canon 16-35mm. 4Why do you use the UniqBall tripod head? For years I used a Wimberly style head, but found it was cumbersome to carry, being so large and also uncomfortable when pressed against my neck. So the smaller footprint of the UniqBall appealed in that way for a start. But the main benefit of it, is how easy it is to level it up, to ensure the horizon is flat. Simply release the lower ball, line up the spirit level, and bang, you're ready to go. Saves so much time either trying to adjust the tripod legs to level it up taking the shots, or faffing around in Lightroom or Photoshop afterwards, to level the shot up. 5What is your favourite subject to photograph? Birds of prey. I find them fascinating, exciting, often elusive and beautiful. They are on the edge of survival most of the time, and rely on other species dying for them to live. And in the UK, they're usually at the top of the food chains, with other predators missing from our managed ecosystems. Trying to narrow down to just one species is harder. I obviously adore the little owls I run workshops with, but find my heart pounding with excitement whenever I see a barn owl. But the feline stare from a short-eared owl, be it perched up looking at me, or flying past, turning its head towards me, is pretty hard to beat. Stunning birds, and a dream to photograph on a bright day. Then there are the eagles... and harriers... hmmm. 6How did you learn to photograph wildlife? Mostly self taught, though I have learned from others; friends and professional photographers. Learning from mistakes made is often the best way though, as they stick in memory, especially if you've made a real effort for something and then goofed up! Of course I have a good library of books for reference, and what isn't covered there, can be sourced online. 7What software do you use for post-processing? Currently I use Lightroom for handling the RAW images, and then Photoshop for final touches. I find each package offers benefits for certain issues to be addressed, so like to use both mostly. Lightroom first, then Photoshop to finish off. I also make use of a plugin tool for handling noise in images, called Neat Image. It is also fantastic for smoothing out backgrounds. 8Do you shoot in RAW or JPEG? RAW. I started out using just JPEG, but once I tried RAW and saw the benefits from it, I never looked back. With RAW, you get everything the camera sees in data form. This means that you can revisit an image years later, perhaps with new post-processing techniques or software, and create a better end product. A JPEG is a diet version of a RAW file, with lots of data stripped away. This limits what can be done to the image during post-processing. For the photography I do, RAW is a must in my view. Not necessarily true for all photography though, where post-processing is not needed, and the images need to be used immediately, e.g. sports photography. 9How much time do you spend on post-processing an image? Depends on the image. Some can be exported from Lightroom pretty much as they were taken, whereas others might need to be tinkered with for up to an hour, using both packages. I actually enjoy post-processing, and explore what options in the packages offer in terms of image manipulation. And there is another benefit from this. By learning what can be recovered or enhanced in your software packages, during post-processing, means you can push the boundaries of the camera when taking the shots in the first place. 11Where is your favourite location for wildlife photography? Probably the Isle Of Mull, on the west coast of Scotland. I first visited in 2010, and have gone back every year since, often several times. I love the whole place, the atmosphere, the landscapes, the wildness of it, and of course the expectation of seeing something amazing around the next corner. It has given me so many wonderful memories, and introduced me to many great people too. 12Where would you most like to go for wildlife photography? Possibly Canada - friends have visited and I've been envious of the wonderful and different array of subjects on offer over there. I'd love to see the great grey owl or maybe a snowy owl too. 13Aside from your camera, what is the most useful bit of kit you have? Definitely my binoculars. I've made the mistake in the past of either forgetting them on a trip or believing they weren't needed. They're essential for looking for the wildlife, working out how I can approach and if it is worth going for. Plus, when conditions aren't suitable for photography, they're great for simply watching through. I have a pair of Kite Lynx HD 8x30 binoculars, which are light, pretty compact, and offer wonderful clarity. They do take quite a battering though, so they need to be tough. 14What advice would you give to someone starting out in wildlife photography? Invest in the best camera and lens you can justify, and use (no point buying a huge lens if you can't hold it! ), and then practise on subjects close to home. It might only be a robin in your garden, or gulls flying over a local lake, but these skills will build up over time, and when you're further afield, or something really special appears in front of your lens, you'll be ready to nail the shot. Oh, and read the manual for the camera, and learn where all the settings are and how to change them. Or simply carry the manual around with you! 15How do you locate wildlife? I have access to various news feeds for wildlife sightings, such as the Bird Guides app, or Twitter which is great for instant sightings. These are often useful for determining whether something is worth traveling to see. A good view from a birder with a powerful scope might not mean it's possible to photograph with the gear I use. I also write a blog of my trips, and try to keep a record of what wildlife I see, where and when. This allows me to pre-plan trips each year to perhaps anticipate seeing subjects, and allow me to plan images. Also, being a member of a variety of organisations is handy, so you can access reserves. I am a member of the RSPB, a local Wildlife Trust, the Wildlife And Wetlands Trust, plus a few others. 16I've seen wildlife photographers dressed from head to toe in camo. Is this necessary? Depends on the subject, but most often, no. I find natural, low contrasting colours, coupled with quiet material, best for what I do. I do have some camo kit, but rarely rely on it. Most issues come from exposed parts of my body, such as face and hands. These can really stand out, so wearing a hat, snood, and gloves can help minimise such issues. 17What is the most frustrating part of wildlife photography? I think the frustration sort of leads to the enjoyment of it, in a way. There are so many elements needed to be in your favour to come away with images of a subject. Obviously there's the subject itself - helps for it to be there. Then there's the weather, the light, the location and other issues, such as other wildlife interfering, or other people getting in the way, and then there's fortune. Luck plays a huge part in this game. There are so many things that can go wrong, and often do, but when the stars align, and you get the images you hoped for, then all the frustration seems worthwhile. 18Do you class yourself as a twitcher, birder or wildlife photographer? 19What do you think of "Trophy Photographers"? In all walks of life, hobbies and professions, there are people who act irresponsibly. The vast majority of wildlife photographers are sensible, respectful and love the wildlife they're photographing. Unfortunately there are some idiots out there that aren't and give everyone a bad name. There's not a great deal that can be done about them, other than try to educate them (if they'll listen). 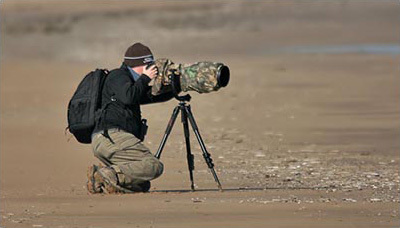 What is frustrating is the way wildlife photographers are often assumed by others, to be like this. I frequently read comments about "typical wildlife photographer" for example, when an observer has spotted someone with a camera, perhaps closer to a subject than is thought to be acceptable. In a lot of cases, wildlife photographers will have spent a great deal of time learning about the subject, and how it can be approached respectfully and safely, so as not to disturb it. But the casual observer, armed with the idea that all wildlife photographers are idiots, will surely get the wrong impression. I might have been watching an otter fishing for a while, and climbed down the shore to somewhere close to where I believe the otter might bring prey ashore, to eat. I sit and wait, patiently for maybe over an hour. Suddenly, the otter catches a large fish, and heads ashore, bringing it out on to rocks where I had hoped. Based on years of experience of photographing these creatures, I start to take images. The otter is oblivious to my presence, and continues to eat. A car drives by and someone sees me near the shore, and near the otter, and wrongly assumes I have approached it, and must be irresponsible. They take a photo of this idiot photographer, disturbing the otter, and post it on Social Media, demanding to identify the 'tog, and amassing lots of angry comments about the person involved. I hope it's clear from this example (not a real life scenario, thank goodness, yet anyway) why this sort of trial by Social Media isn't always fair, and what harm Trophy Photographers are doing to the rest. 20Do you use Social Media much? Yes, and currently make use of Twitter, Facebook and Instagram, as platforms to air my images, advertise trips and workshops, and also to keep abreast of topics that concern me.